A few weeks ago I posted about our experience assisting in a medical emergency on our flight home on Hawaiian Airlines Flight 50 HNL-JFK. It was a popular post and it was interesting to see what others thought of the situation. While I was surprised with the all the medical equipment onboard, many of you told me this was all standard so I definitely learned a few new things out of this whole experience. 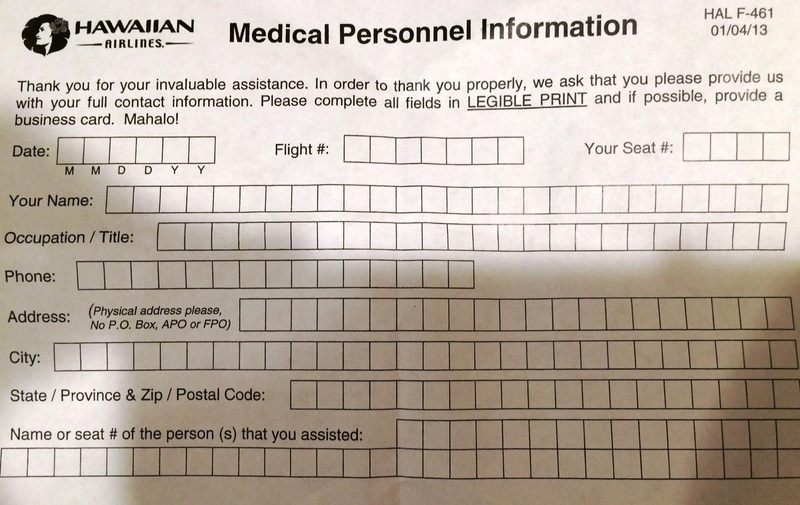 As mentioned in that post, one of the flight attendants asked for our contact information and we filled out the form above. I forgot about giving them my contact info so I was surprised again last week when I saw a big box on my doorstep that came from Hawaii. My wife asked me if I ordered anything from Hawaii and I didn’t – I had no idea who or what this was. 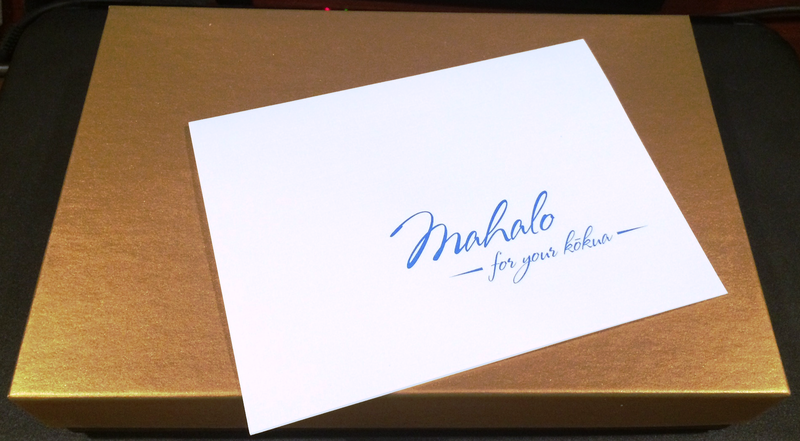 It turns out Hawaiian Airlines sent us a little gift as a way to say mahalo. 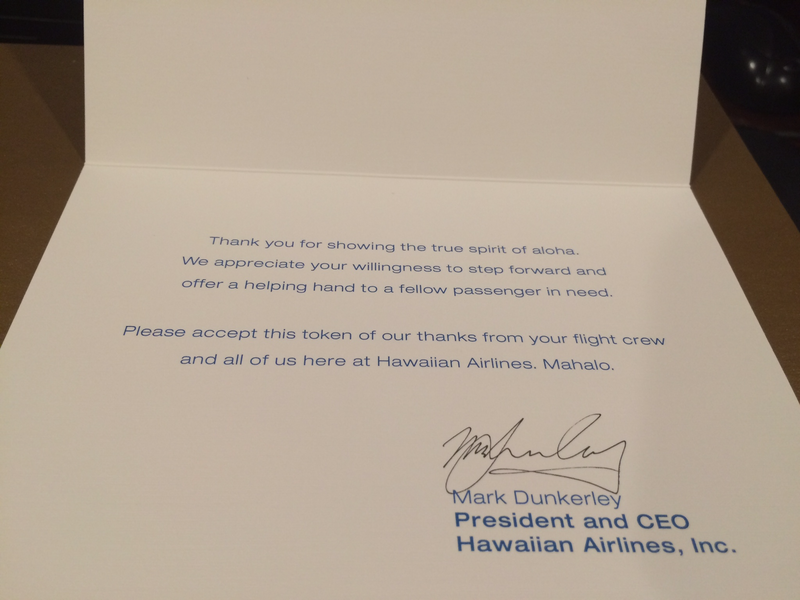 This was a nice and welcoming surprise from Hawaiian Airlines. I don’t feel we were owed anything from the airline but I think acts like this reflect the true spirit of the airline. Hawaiian is know for their in-flight service (especially compared to US legacy carriers) and it seems to emanate through all levels of the airline. 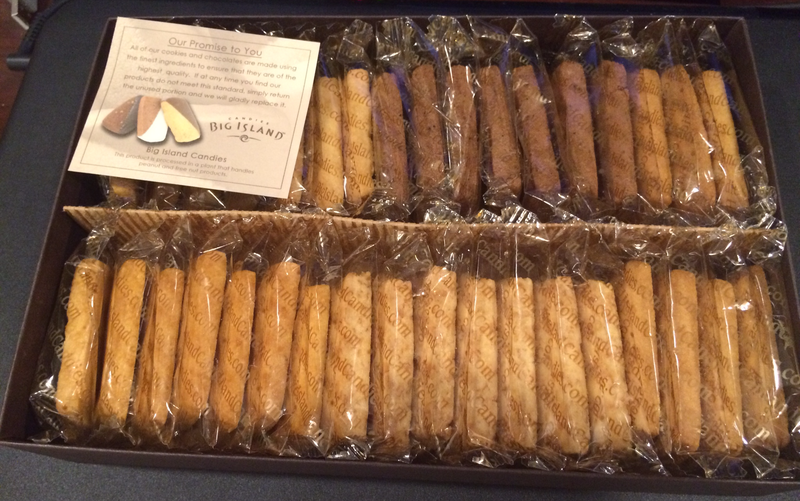 Thank you Hawaiian for the delicious cookies! A co-worker of mine is heading to Hawaii this summer and he smartly sought my advice on the best use of miles to get to Hawaii and also how to jump between various islands. When he brought up which miles to use to go from the Big Island to Maui, I remembered a great deal that I recently took advantage of for my trip to Hawaii next month – using only 3,000 Virgin America Elevate points for inter-island flights on Hawaiian Airlines. Virgin America points aren’t like traditional miles found in programs like Delta, American or United. Instead, they are revenue based, more similar to JetBlue or Southwest’s frequent flyer program. On average, Virgin America points are worth about ~2.2 cents when redeemed for Virgin America flights, however you can also redeem Virgin America points on various partners including Virgin Atlantic, Virgin Australia, Hawaiian Airlines, Singapore Airlines & Emirates Airlines. To start, it is important to figure out what other airlines charge for inter-island flights. For the same exact one way Hawaiian Airlines flight, Hawaiian charges 7,500 miles, United charges 6,000 miles, American charges 5,000 miles, Delta charges 7,500 miles while Virgin America only charges 3,000 points. Now while Virgin America is cheaper than the competition you do have to remember that if you do not have Virgin America points, you can transfer from American Express at a 2:1 ratio, so the cost is really 6,000 American Express Membership Rewards one-way in that scenario. Personally, I like to use my United and American miles for bigger, more expensive trips such as business class to Europe or Asia so I would rule those options out as I want to converse those miles. Hawaiian and Delta both charge too many miles for my taste (and I try avoiding collecting miles in those programs as a general rule of thumb) so that leaves me with Virgin America as my top choice. If you want the absolutely cheapest option (assuming no Virgin America points) or you have some spare American miles leftover that you have no other intentions for, 5k on American Airlines would be my second choice on this list to book. If you’ve followed my blog, you would have noticed I’ve posted several free or really, really cheap (under $1) offers for Virgin America points including this one for 500 points and how to spend 99 cents to get another 500 Virgin America points. So assuming you’re a loyal reader and followed my awesome advice (you’re welcome), you now only need 2,000 Virgin America points for this flight (or 4,000 American Express Membership Rewards points). Considering the retail value of these flights, which can range from $80 – $100 or more if you book last minute, redeeming points is a great deal. Especially if you have a handful of Virgin America points that you wouldn’t use otherwise! I recommend searching award availability on either united.com or aa.com before booking these flights. Virgin America should have the same access other partners have to the award space. From there, here is how to book these flights on Virgin America. Once you’ve confirmed availability on Hawaiian Airline flights only, write down the flight numbers and call Virgin America at 1.877.FLY.VIRGIN (877.359.8474). You cannot book these flights online. 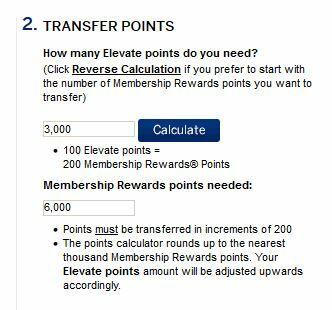 When you get to the phone prompt, choose Elevate and after selecting award travel, choose partner airline. In my experience, Virgin America’s agents are very good. 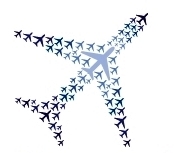 The agent I had was very knowledgeable and was able to find the flights after I read her the flight number. Virgin America will NOT charge you the $20 phone booking fee since this is a partner award that cannot be booked online. After collecting the taxes on your award, the agent will let you know they generally need 24 hours to confirm the flight with Hawaiian and issue your ticket. I received an email from Virgin America about 30 hours after I contacted them. In the email, it had both the Virgin American confirmation code as well as the Hawaiian Airlines confirmation code to select seats. In the event you need to cancel or change the award, there is NO redeposit fee (at least according to my email confirmation). This was a pleasant surprise but good to know in case plans change. Both Andrea and I had a little over 2,000 Virgin America points in our account from the promotions mentioned earlier in the post and one flight we took on Virgin America back in 2013. We only need another 1,000 points so it ended up costing us an additional 2,000 American Express Membership Rewards points each to save $125 per person on the quick, 33 minute inter-island flight on Hawaiian Airlines. We each got over 4 cents in value per Virgin America point which is better than redeeming points for flights on Virgin America. The next time you go to Hawaii I would strongly consider this option to cover your inter-island flights. Award Trip Breakdown: Maui Wowie! *This will be an irregular series on some of the free (or almost free) trips I’ve booked. I’ve posted short summaries of these trips on this page but this series will go more in depth and I’ll breakdown how I booked this trip. Andrea and I just got back from Maui on our 2nd Honeymoon and it was an absolute blast – the perfect balance between a nice relaxing vacation on the beach sprinkled in with some activities such as a rainforest hike to waterfalls and a canoe outrigger experience. Fortunately points and miles made this 2nd Honeymoon a reality and in this post, I’m gonna breakdown exactly how I booked the trip with points and miles and how I acquired the points and miles needed for a trip like this. Departing: Hawaiian Airlines JFK-HNL-OGG for a cost of 17,500 miles plus $5 in taxes per person. Return: Hawaiian Airlines OGG-HNL-JFK for a cost of 17,500 miles plus $5 in taxes per person. Once I saw Hawaiian Airlines offered a direct flight from NY to Honolulu, I wanted to book this flight for our Hawaiian getaway to avoid stopping in LA or SF. There are two basically two main ways to acquire Hawaiian Airline miles – 1) Hawaiian Airlines credit card from Barclays or 2) Transferring American Express Membership Rewards points to Hawaiian Airlines. Andrea and I decided to each open a Hawaiian Airlines credit card (though it was from Bank of America a year ago) as the credit card offered a signup bonus of 35,000 miles for spending $1,000 in three months. The annual fee of $79 was not waived. The minimum spend was pretty easy to accomplish based on our normal level of spending so it wasn’t long before we had 36,000 miles each (35,000 bonus miles + 1,000 miles for spending $1,000). Hawaiian Airlines charges 40,000 miles roundtrip from the mainland US to Hawaii but as a cardholder, you were entitled to a 5,000 mile discount on award flights, reducing the cost per person to 35,000 miles plus $10 for taxes roundtrip! So for paying an annual fee of $79 each, we got our flights to Hawaii covered. Compared to the retail cost of these flights of about $1,000 each, we got a deal! Back in early 2013, I applied for the Citi Hilton HHonors Reserve credit card which offered a signup bonus of 2 free weekend nights at ANY Hilton Hotel for spending $2,500 in 4 months . The annual fee of $95 was not waived. The Hilton family includes Conrad, Hilton, Hilton Garden Inn, Waldorf Astoria, etc. so to make sure I maximized the value of the free nights, I made sure to use them at a Conrad or Waldorf Astoria. Additionally, this credit card grants you Hilton Gold status which gives you free breakfast, room upgrades and other benefits when staying at Hilton Hotels. This is a HUGE perk! With the flights booked to Maui, I booked our first two nights in Maui at the Grand Wailea. In addition to getting the nights for free, by using points we avoided the $25 daily resort fee, so our bill would have literally been $0.00 if we didn’t have a rental car which we had to pay for parking. Nights here can go for $300-$600 depending on the time of year, so we easily got $600-$1,200 in value. The Andaz Maui is a brand new hotel that opened in fall 2013 so of course I wanted to stay there on our trip. The Andaz Maui costs 22,000 points per night or you could use half the amount of points per night, 12,500, plus a co-pay of $150 per night. I opted to use 12,500 points + $150 per night but you could easily use all points to make the stay free. I did this because by paying a small co-pay per night, I could apply a suite upgrade certificate I received from opening the Hyatt credit card (more on this in a future post). To acquire Hyatt points, I transferred points from my Chase Ultimate Rewards account. In the past I signed up for several Chase Ultimate Rewards cards, including the Chase Sapphire Preferred and the Chase Freedom. The beauty of Chase Ultimate Rewards points is they can transfer to many different airlines and hotels including United, Southwest, British Airways, Marriott, Hyatt etc. so you can use them as needed. I had over 150k Chase Ultimate Rewards points from signup bonuses, everyday spending and other small promotions so I transferred 75k Chase Ultimate Rewards points to Hyatt to book the stay. My total cost was 75,000 Chase Ultimate Rewards points plus $900 which might seem steep until you consider this hotel routinely goes for almost $600 a night for a standard room and a $1,000 for a suite, which we stayed in! For 6 nights in our suite, it would have cost $6,000 (which I simply couldn’t afford) so paying $900 represents a pretty nice discount!! From good flights on Hawaiian Airlines to a great stay at the Grand Wailea to an AMAZING stay at the new Andaz Maui at Wailea, Andrea and I can’t wait to return to Maui. Remember, this can be you and I’d be happy to help you get there!